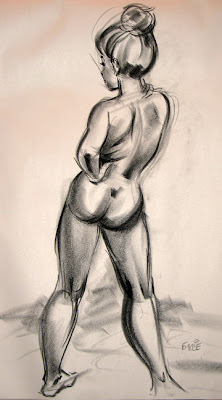 Here are some more sketches of Heather, one of our regular life models at Visual Arts Brampton. These are from various sessions over the last couple of years. 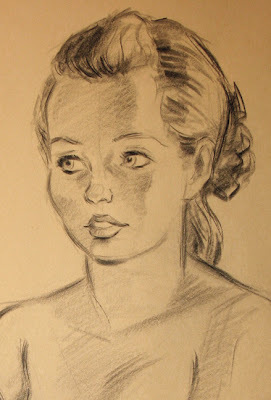 Probably because of my interest in caricature and always wanting to obtain a likeness, oftentimes I will concentrate more on drawing the face than I really should in a session. Here's a traditional portrait I drew of Heather during a 30 minute pose. Again, I probably spent too much time on her face getting the likeness in this one, when in fact I should have perhaps checked the proportions on her body more closely before finishing. In hindsight, her head seems slightly too big relative to her body. I still like the drawing though. At some point during the evening, I just can't help but revert back to my cartoonist inclinations and take a more caricatured approach to drawing the model. I love making a cute pose even cuter, looking for ways to idealize the form in order to get as much visual appeal as I can. 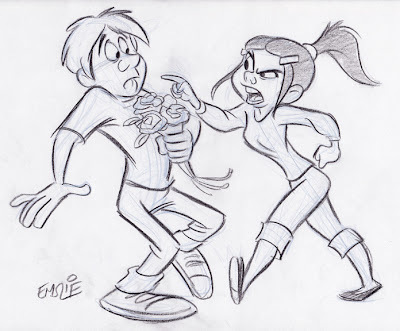 This drawing is one of my favourites of Heather. She had a different hairstyle that evening and the added texture and waviness was fun to draw. The lighting was quite dramatic, so I tried putting in some cool blue shadows along with the warm reds. This one may be destined to hang on my den wall sometime soon! Again, both the dramatic lighting and Heather's pose inspired me to try something unique with this drawing. It suggested a look of cowering in fear, so I adapted her expression to play up the melodrama. The resulting image puts me in mind of the type of illustration you used to see on the covers of dimestore crime novels. I'm tempted to try doing a painted version of this sketch someday, where I can really simulate one of those old pulp fiction covers! I've been a bit busy lately since I've just started up again with teaching at the college. So nothing too interesting to post today. I was going through some files on my old computer, transfering stuff over, and came across this series of character drawings. This was done originally for the newsletter that used to be published by the Toronto Animated Image Society (TAIS), and had accompanied an article I'd written on the subject of posing and body language. I thought my Sheridan students might get something out of these, as we've been talking about character posing. That's all I've got for today! 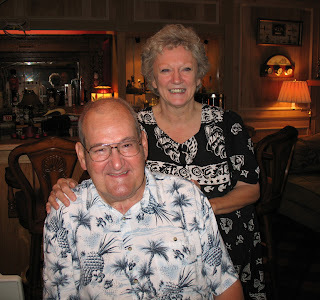 Yesterday I received the very sad news that my friend from my Walt Disney World days, Ralph Kent had passed away. It wasn't unexpected, as poor Ralph had been in declining health for awhile now and a mutual friend had recently informed me that Ralph's doctor had estimated he only had a few weeks left. In the dozen years since I'd left my Disney job in Florida, Ralph had gradually been getting health problems due to his diabetes, but what finally did him in was a year long bout with cancer. I'm not sure how old he would have been, but I'm guessing he must have been approaching 70 when he died. I first met Ralph Kent back in 1976. I was just a teen kid at the time, but I was able to arrange a visit to the Walt Disney World art department during one of my family's annual vacations down to the Florida theme park. 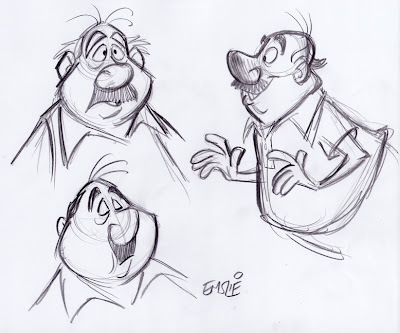 It was at that time I met character artist, Russell Schroeder, who is still a dear friend after all these years, as well as fellow artist, Harry Gladstone, both of whom would be instrumental years later in helping me start my own career with Disney. Ralph Kent was the head of the art department back then, and he was quite keen on some little Disney figurines I had sculpted and was showing to the guys down there. He said I should keep in touch after I finished my schooling and maybe they could get me down there working in the art department. Sadly, a few years later there was a series of layoffs which saw the letting go of many in Disney's art area, as well as many in middle management, including Ralph. I believe Ralph was freelancing for about the next ten years or so, working on creative projects for Goebel and others. In the meantime, I had started my Disney career in the character merchandise division that was here in Canada, leaving my Ottawa home to come work for Disney in Toronto in 1984. Six years later, due to the help of Russell Schroeder, I was able to relocate down to Florida to take a position in that art department I'd always wanted to work for. 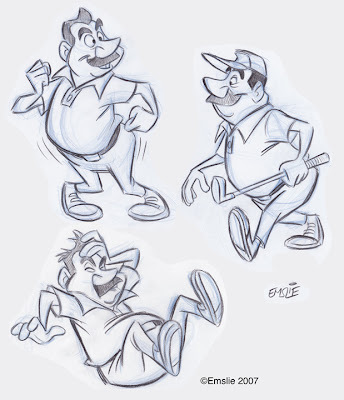 Coincidentally, not long after I started working at WDW in 1990 I was reacquainted with Ralph, who was in the process of being rehired by Disney as a character artist in their newly established Character Merchandise art department. It was great to see Ralph again after all those years, and we quickly became good friends and frequent lunch buddies. Ralph was also a regular fixture at a ramshackle little bar in Kissimmee called "The Big Bamboo", where he held court regaling Disney fans and tourists with stories of his life at Disney and sketching pictures of Disney characters for them on napkins and such. One time I remember he had been given some flak about that from one of the Disney execs who told him he couldn't draw Disney characters for people. Ralph said to him, "Somebody else told me I could". When the exec furiously asked him who had given him that permission, Ralph looked him in the eye and replied,"Walt did". Ralph meant it too, as he had started his career back at the Disneyland art department in Anaheim sometime in the early 60's I believe, maybe before that. He said Walt would often drop by the studio and was quite friendly towards them all. 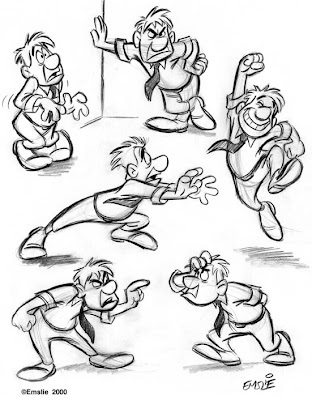 According to Ralph, Walt actually encouraged the Disney artists to do little sketches for people when asked, as he felt that it was a nice little goodwill gesture. When Ralph was first approached in 1970 to relocate to Florida to head up the new art services department that would be set up at the brand new Walt Disney World opening in 1971, he was rather reluctant about doing so. You see, Ralph was passionate about being a Disney artist, as that had always been his dream ever since he was a kid himself. To now be thrust into the role of an administrator didn't sit well with Ralph. They assured him that the move would only be temporary, and that he would be brought back to his old job once things were up and running well in Florida. Unfortunately for Ralph, that never did happen, and so he was in a managerial position that, by his own admission, he didn't feel comfortable at. 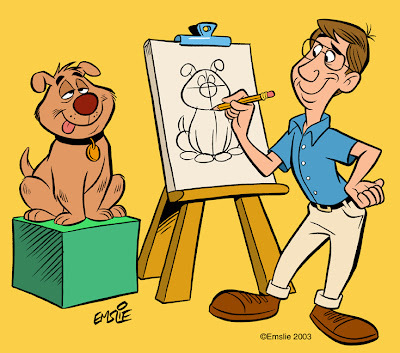 When he was let go in the round of layoffs some years later, I know it hurt Ralph like hell, as all he ever had wanted to be was a Disney artist. I am glad to report, however, that once Ralph was hired back in 1990, he started to get the respect that had long been due him. Disney, to their credit, now treated him as a veteran artistic talent and, just several years ago when he had retired due to his ongoing health setbacks, the Company officially designated him as one of the "Disney Legends" that year. 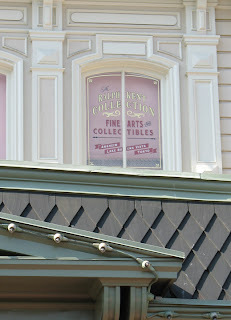 In addition, he was also presented with his own "Window on Main Street", in the Magic Kingdom in WDW, which I know was something that he took great pride in. Here is a photo of that window right above "Coke Corner" that I took on my trip there last year. That was also the last time I saw Ralph, when I'd gone back for a vacation in Florida after an absence of nearly ten years having stayed away. It was just wonderful to see him again after all those years. Here's a photo I took of Ralph and his wonderful wife, Linda, while visiting their home. Despite his health problems and looking older, he was still the same ol' Ralph in his friendly, easygoing manner and everpresent big grin. He seemed to have taken things in stride, not dwelling on his problems, and was still talking enthusiastically about his creative projects that he still intended to pursue. We had a really nice visit, but when he told me about the recent diagnosis of cancer I was afraid that this might be the last time I'd get to see this dear man. Sadly, this turned out to be the case and today all the memories of our friendship are just flooding back into my mind. 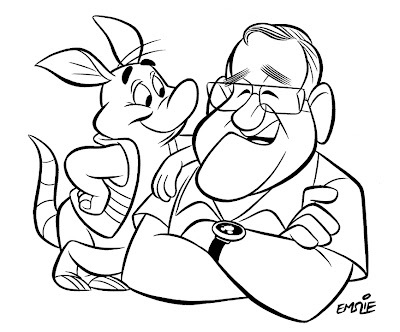 Ralph was a lovable guy who brought so many people a lot of happiness through his art and genuine warmth over his long and successful career at Disney. He will be missed greatly by all who loved him. It looks like Burt Reynolds is heading up here to Toronto to accept an award for all of the charity work he's done for kids over many years. Here's an article about it here. 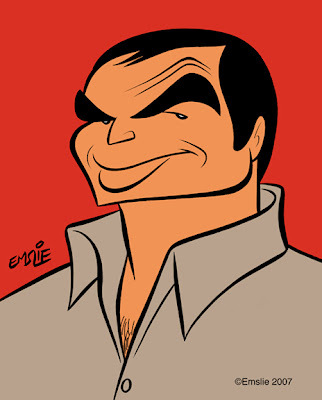 I think that's great, as I feel that ol' Burt has been given a bad rap over the last decade or so from critics that like to hold him up to ridicule for some of the roles he's had in recent years. The fact is, Burt's long past his leading man days of the 70's and is now firmly in that category we call "character actor". As such, he sometimes gets cast in roles where he's playing rather sleazy or ridiculous characters, like the congressman in "Striptease". Hey, an actor has to keep working, so I don't begrudge him a thing. However, I think it's only fair to bear in mind that Burt Reynolds was the box-office champ for several years running from 1978 to 1982. Even before that, he'd made quite a number of really good films, especially these two, "The Longest Yard" and "Hustle" that were recently cited on Jeremy Richey's excellent blog, Moon in the Gutter. 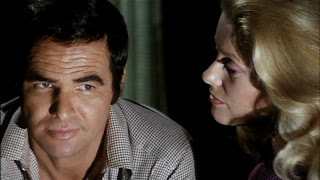 Unfortunately, the big box-office receipts came later when Burt was firmly entrenched in his good ol' boy roles in such films as "Smokey and the Bandit", "Hooper" and the rather silly two "Cannonball Run" films. I must confess, "Smokey and the Bandit" is still a guilty pleasure of mine, although I prefer a lesser known film he'd done just a couple years earlier called "W.W. and the Dixie Dancekings", which also had him playing a sort of southern fried Robin Hood but in a film that really had a lot more heart. From what I've heard, that film is one of Burt's personal favourites too. Much to my dismay, though I think it might have been out briefly on VHS years ago, it has yet to be released on DVD. I continue to hold out hope for that to happen. In the meantime, here's to ol' Burt - I'm happy to see him being honoured here in Toronto for his charitable work on behalf of the kids! "The truth is, I'd never seen a Cary Grant film. Since then I have watched his stuff and it's astounding, but I don't see any similarity between us. Except for the fact that I'm told he used to wear ladies' underwear, which is something I also do." 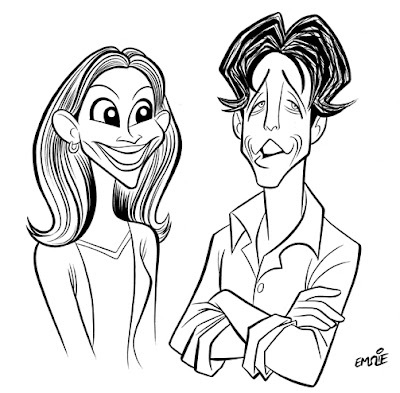 The caricature above is one I did of Hugh from the film, "Notting Hill", along with his leading lady, Julia Roberts. This was the second of several collaborations he's had with screenwriter/producer, Richard Curtis (who had achieved much success previously, writing the Brit TV shows, "Blackadder" and "Mr. Bean"). Their first film together was the incredibly funny, yet heartbreakingly poignant, "Four Weddings and a Funeral", which is also probably the film in which audiences first took notice of Hugh Grant. Richard Curtis seems to have a knack for writing the kind of dialogue that seems perfectly natural for Hugh to speak, and I suspect they share a similar sense of humour. I've seen many interviews that Hugh Grant has done on various talk shows over the years, and he seems to be just as naturally witty offscreen as well as on film. Here's a good example from the Letterman show in 2002, at which time he was promoting his latest, "About a Boy", which also happens to be my personal favourite Hugh Grant film. This interview runs about 11 minutes, but it's time well spent I can assure you. Enjoy! 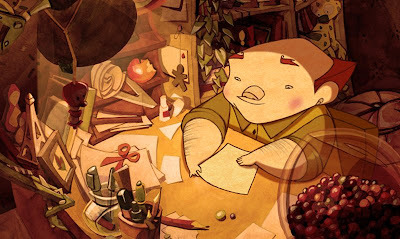 Just look at this lovely, joyful little film I came across on the blog of Genevieve Godbout. This is a 3rd Year group film from the Gobelins school in France, in which Miss Godbout was one of the students who contributed. The running time is just less than 2 minutes and the idea is very simple and clear. The characters are very simple and solid in their design, making them quite conducive to full, fluid animation. The backgrounds are a particular treat, being entirely hand painted as far as I can tell, with a warm and visually appealing colour palette. The main reason I am posting this, is that I am hoping it will serve as inspiration to my crop of 2nd Year students from last year who are about to embark on their 3rd Year group film project at Sheridan College. This little film well illustrates just what can be done when you keep your idea simple, resisting the temptation to do something more "epic" in scale. Also, in order to complete a film like this takes cooperation among all members of the group. A lovely effort like "Sebastien" proves that it really is quite possible to achieve! By the way, these thoughts are but a small echo of what Mark Kennedy also posted about last week in far greater detail. Definitely a good read. 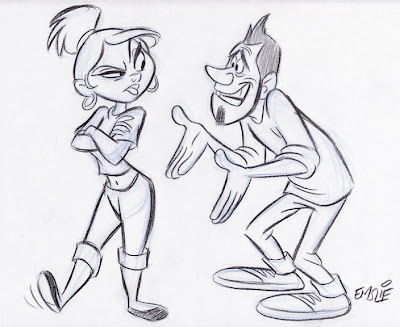 This week I head back to teaching 2nd Year Animation Character Design at Sheridan College here in Ontario. 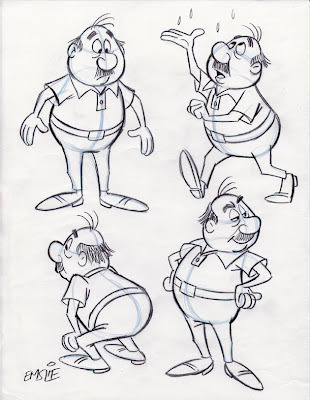 As John Kricfalusi has just posted this very informative article regarding character design on his blog, I thought I might tie into what he is saying once again. This post deals with what John describes as the "Functional" aspect of the design process - just understanding how simple forms placed together in an appealing manner is the foundation that an animator/cartoonist starts out with initially. These drawings posted below are fairly simple, as they were done not for Sheridan students, but rather, for a more basic cartooning class I have taught informally at a couple local venues over the last several years. As such, they are not as "animated" as I usually prefer to draw, lacking a feel of "Squash and Stretch" that would give them more of an organic, pliable quality. 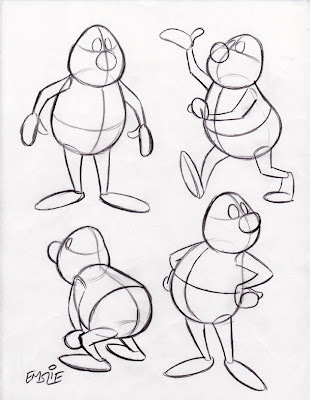 But they serve the purpose of showing the concept of how to draw a simple constructed character in a variety of poses while maintaining consistency of form and proportion. Remember, this particular cartooning class included several students who were just beginners! Here are the simple constructed forms, with guidelines to determine the tilt and angle of the head and body, as well as for consistent placement of all of the surface details. Though pictured in black line here for clarity, it is recommended you draw this stage lightly with a blue pencil in order to distinguish it from the finished outline and details you will be adding on top later. Here is the finished character with all surface details added, and the light blue underdrawing still slightly visible so that you can see how it is done. As you can now see, those guidelines have helped in the accurate placement of his facial features, as well as the collar of his shirt and belt line too. Also notice how I've varied his expression and eye direction in order to create some personality and more visual interest. When drawing different tilts and angles of the forms, you also have to understand some of the basic rules of perspective in order to give the illusion of a solid form rotating in space while maintaining a consistent volume. 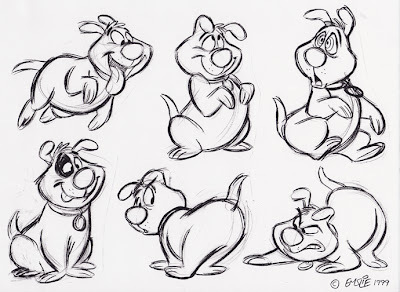 Again, as John always tells beginning cartoonists, it's a good idea to learn what you can from the Preston Blair book, as that's quite honestly how most of we professionals learned in the beginning, back when we were young! 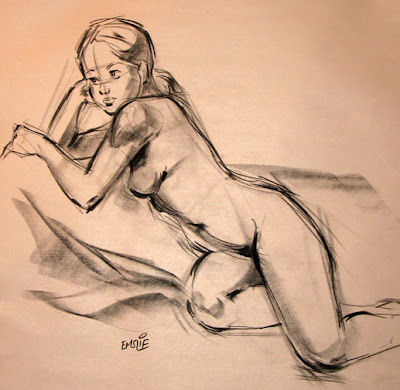 Artistic styles may change over the years, but the fundamentals of good solid drawing do not. PS: I dedicate today's post to young Chet, who was looking for some advice on how to construct a cartoon character. I hope this helps him out a bit.